This embedded Tableau Public-published dashboard reveals a problem with Tableau's text kerning. The spacing bordering bolded and italicized text is greater than it should be, sometimes much greater. With bolding, it appears that the character immediately preceding the bolded text influences the magnitude of the problem. How about for tool-tips? is the issue there as well? If not, I suspect Tableau could take whatever text rendering they are using in their tool-tip, and apply it to their text areas. Good theorizing, Joe. 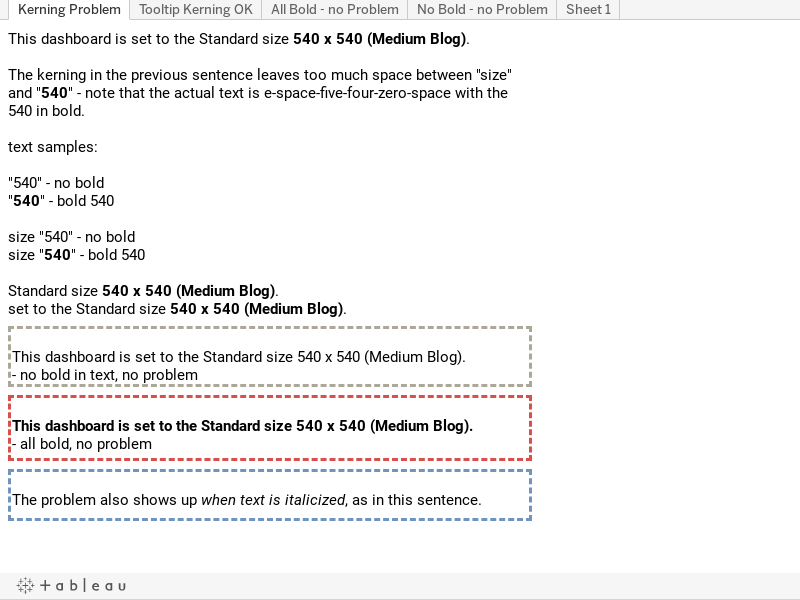 I created the worksheet "Tooltip Kerning OK" and put the same dashboard problematic content into its tooltip and it renders properly there. It's interesting that Tableau apparently uses separate rendering engines for these areas. Looks like they are rendered very differently in the web browser. The view of the dashboard is a grid of images that were rendered on the Server, and the tool-tip is formatted text that the web browser displays. The issue seems limited to just Tableau internal's font rendering. Also your example tool-tip does not have any italics. IFNULL - is not "IF NULL", is "IF NOT NULL"